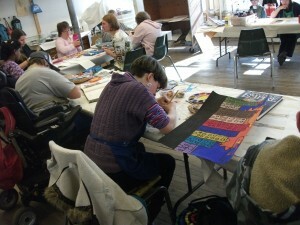 Art Lab is an imaginative visual art program serving adults with special needs, offering two sessions on Wednesdays, 9:30–11:00am and 3:30–5:00pm. The annual calendar for Art Lab includes Fall, Winter, Spring and Summer seasons established in conjunction with AVA’s Art Lab partner, the Special Needs Support Center. Art Lab is a joint collaboration between AVA and the Special Need Support Center with additional funding provided by the Highfield Foundation.